The omega-3 fatty acids in fish oil help protect your cardiovascular health by lowering cholesterol, fighting inflammation and decreasing blood pressure. They’re also needed in your brain and nervous system. Extracts of oil from a variety of fish are used to produce supplements. The amount of omega-3 and other fats you'll get depends on the source of the fish oil. 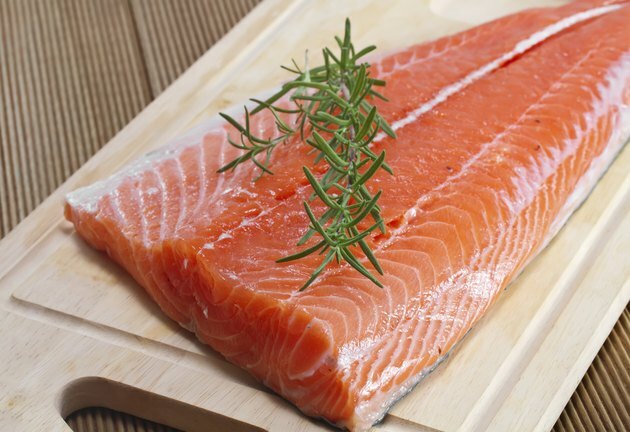 Salmon oil outshines others for its high omega-3 content. Fish oil contains two types of omega-3 fatty acids: eicosapentaenoic acid, or EPA, and docosahexaenoic acid, or DHA. Supplements usually list them separately on the label, but if you encounter one value for omega-3, it represents the amount of EPA and DHA combined. This combined value is a good way to compare different types of fish oil, especially since they do not have separate recommended intakes. Instead, the Institute of Medicine recommends that women consume 1.1 grams of total omega-3s daily, while men should get 1.6 grams. All types of fish oil contain 123 calories in a 1-tablespoon serving, which comes entirely from fatty acids. One tablespoon of salmon oil contains 4.25 grams of combined EPA and DHA, according to the U.S. Department of Agriculture. By comparison, the same portion of menhaden oil has 2.95 grams, while sardine oil has 2.8 grams and cod liver oil contains 2.4 grams. Herring oil has 1.4 grams per tablespoon. The proportion of DHA to EPA is almost equal, with about 50 percent to 60 percent of the total omega-3 coming from DHA in salmon, cod liver and sardine oils. Herring and menhaden oils are the opposite: About 50 percent to 60 percent of their total oil is EPA. Omega-3 fatty acids are polyunsaturated fats. Fish oil also contains monounsaturated fat, saturated fat and cholesterol. The five types of fish oil have about 3 to 4 grams of saturated fat in 1 tablespoon. Their monounsaturated fat content ranges from 3.6 grams to 7.69 grams, and they have 66 to 104 milligrams of cholesterol. You won’t find it in supplements, but menhaden oil is also hydrogenated into a solid product used in baked goods and other foods. Hydrogenated menhaden oil consists of nothing but saturated fats. Cod liver oil is the only fish oil that naturally provides vitamins A and D. Vitamin A comes in several forms, and two of them -- retinol and retinal -- can accumulate to toxic levels in your body. One tablespoon of cod liver oil has 13,600 international units of vitamin A in the form of retinol. This amount exceeds the tolerable upper intake of 10,000 international units, which is the most you can safely consume in one day. You’ll also get nearly double an entire day’s recommended intake of vitamin D.